The Focus has embodied polarizing exterior styling since its inception. Fans of hatchbacks and high taillights will continue to be entertained. The rest will exclaim a love it or hate it difference of opinions. Overall the design seemed to work better without the sharp front fender creasing, absent from more egg-like designs of previous versions. Sport appearance body kit added sporty to economy, but for a price. This Focus had a fancier than most ST interior with racing-style buckets and two-tone treatment. Even with the upgrade the Focus interior wraps one in an econobox-style environment. Nothing too supple, yet nothing horrific either. Grabby bits for seat control were somewhat difficult. The heated seat option, however, was most welcome in the chilly Sierra Foothills. As stated previously the PZEV engine is not going to get the Focus into the tens at the drag strip. That being said, the engine delivers predictable and usable horsepower across the entire range of the tachometer. Turning traction control to the off position got rid of the oddball turn in bog, and added to the fun. Count to five until the pictogram of the wheel spitting rocks goes away. The brakes are of the typical econo front disc rear drum variety. While the binders worked the way they should, the small rear drum units looked odd at the center of the large 17" SVT wheels out back. Beyond looks, the brakes worked well enough to stay out of trouble on complex and varying surfaces, such as a wet blanket of pine needles. Surprisingly compliant for a short wheelbase car on a set of low-profile high performance tires. The Extended California speed limit driving on the clunking surfaces of Interstate 5 proved slightly less luxurious over the hours. Unlike the discontinued SVT Focus this Focus did not have the Special Vehicle Team work over to the suspension to back up the hi-po Pirelli tires. The Focus did not seem to mind though. The well-sorted suspension served apex duty predictably, and without complaint or drama. The five-speed manual in the Focus offered smooth-as-butter operation. The dual-mass flywheel and low effort clutch added to the effect. Shift lever location was a slightly mysterious at times, but no gears were missed. More definitive feedback from the shifter would have been welcome. 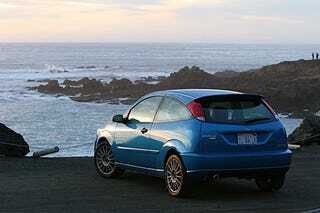 This test Focus had the factory super bass-induced system 6-CD system with Sony Speakers and a subwoofer in the hatch. We tested sound briefly with some old rock steady coming over the airwaves somewhere near San Jose, but the low-power college station unfortunately faded into static. It sounded great while it lasted. Art Bell sounds fine on the system. The Focus was not equipped with video. Value is the key to the success of the Focus, which is nothing if not a fun to drive econobox. The various packages and options installed on the test car pushed the MSRP of this particular Focus into the 21K range. Loaded, Johnny! The only thing that may or may not have qualified as a toy in the Focus was the counterintuitive audio control module nub on the lower left of the steering column. While this device was mildly entertaining for a few minutes, it became apparent it was much easier to reach over and press buttons and turn the dial on the audio unit itself. The trunk in this Focus was a hatchback. Plenty of room with the split rear seats either up or down. This, the benefit of a hatchback. We could not, however, fit two Fat Track Sizzlers sets and a bicycle in the back. The Ford Focus hatchback with the 2.0L PZEV engine is a fun and practical car that emits the same or less tailpipe emissions than many hybrids and delivers respectable mileage. The addition of the body kit and wheel and tire package brought an additional element of fun to the tarmac, but also pushed up the MSRP to over 21K. While the Focus is a good ride, the underlying feeling that it could be an amazing one percolates slightly beneath the surface, and leaves one wishing that Ford had kept the SVT team working on the platform.